Correct and timely maintenance of the floodlights ensures not only efficient operation, but UEFA certification. Tight control of obtrusive light ensures the surrounding buildings and environment are not affected by the stadium’s activities. 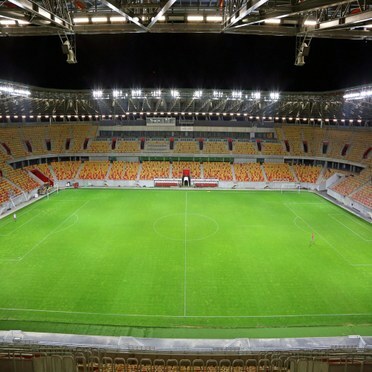 Białystok City Stadium in Poland was first opened in 1971 and is used by the top division Jagiellonia football club. 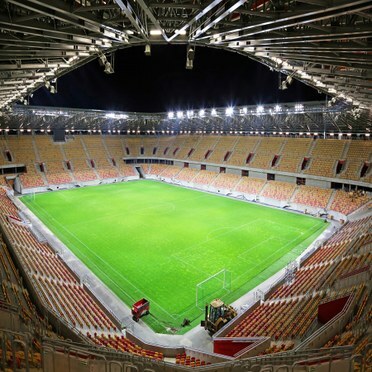 It has recently undergone a major redevelopment including an increase in the seating capacity from 7,500 to 22,409 and the provision of new lighting. With the previous lighting installation not exceeding 1000 lux, the first objective was to improve the lighting to enable high definition sports TV broadcasting. The second objective was to increase the illuminance level to comply with UEFA and Polish Football Association requirements, in order to be granted a playing license. Thorn was awarded the contract to refurbish the pitch and stand lighting using its Mundial floodlight and Titus Industry luminaire. Mundial 2000W HQI-TS provides the pitch lighting and is a high power and performance floodlight specifically designed for sports applications. It was chosen on the basis of its ability to achieve the required light levels of 3000 lux with just 240 floodlights. Using two optics (S/S and R/S), a circular reflector with symmetric distribution is used for the long-throw application while a baffle is used to achieve symmetrical light distribution with low glare and minimal spill and upward light. For the stand lighting, Titus Industry T16 (T5) 4x80W and 2x80W offers a robust solution while providing a comfortable environment for spectators with mounting brackets which allow stepless tilting up to 50°.